A lot of people judge how good is the brush base on the softness of the bristles. Sometimes brushes that are too soft can't pick up the product that well and you will ended up wasting the product and wasting your time because the product don't transfer to your skin. Always read review of brushes before jumping into getting it. One of the earlier advice that I got from someone was that makeup brush is a form of investment therefore we should buy the expensive ones. After attending a few beauty expos and getting to know the industry better, I find that some brush that cost RM200+ and RM30+ probably comes from the same factory and produced from the same materials. It's all about branding and making you pay for the marketing prices. As a makeup beginner (or veteran) you only need brushes that does its job well, and I find some cheaper or average priced brush is apt. Bristle is the "hair" of the brush. It comes in synthetic (artificial hair), natural (horse mane, squirrel hair, etc.) or hybrid of the both. Normally people with sensitive skin works better with synthetic hair (for face brush). Meanwhile, natural hair bristle gives a better effect in blending (for eyeshadow). The shorter the bristle, the easier for you to control the brush, hence some work that needs extra concentration needs shorter bristles such as eyeliner brush, foundation brush, contour brush and eyebrow brush. On the other hand, brushes that you apply loose powder and fan brush works better with longer bristles. The handle of the brush plays an important part in your makeup experience. A lot of people make the mistake for buying long handle brush thinking that it has more surface area to grab on. However, long handle brush is made for makeup artists to apply makeup on clients. The best size of brush is slightly bigger than your hand when you grip it. It gives you better control of the brush and you won't poke the mirror when you get close to it. 3 brushes is enough - one for foundation, one flat shader brush for picking up eyeshadow and one blending brush to smoke out your eyeshadow. As for blusher, you can use the same foundation brush or use the available brush from the packaging. 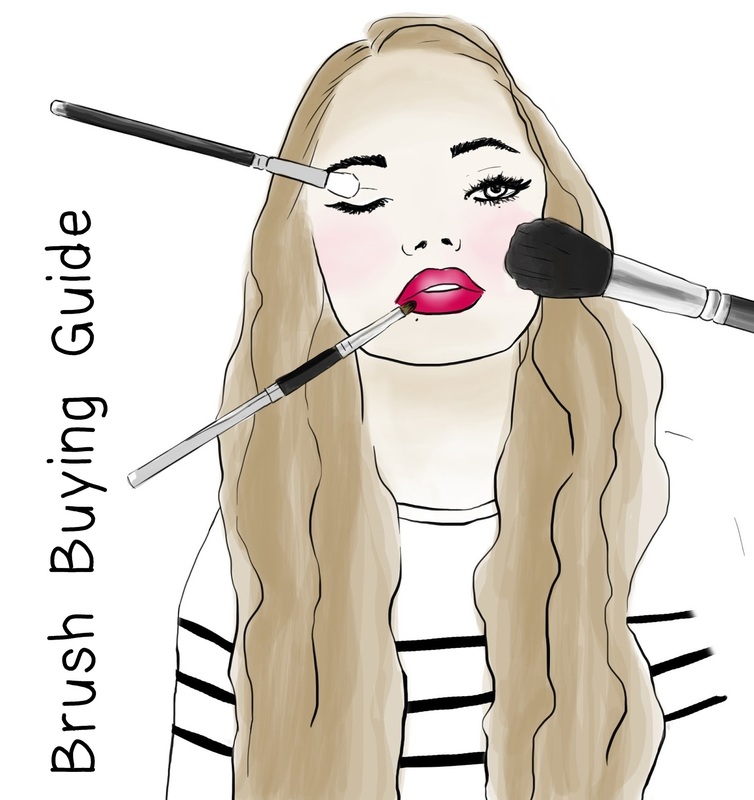 Blush brush is not really that important for beginner. As a beginner in makeup, I wouldn't recommend you to incur extra cost to purchase special brush cleaner. Use baby shampoo. And if you don't have baby at home and don't want to buy it, use your facial wash. If it is good enough for you face, it should be good enough for your brush. Today so happen there's a special launch of the Colours Cosmetics Brush. Since we're talking about brushes, I want to take the opportunity to introduce to you this new brush brand. You probably haven't heard of Colour Cosmetics Malaysia. This company took a very long time to develop the brush and finally Colour Cosmetics Malaysia brushes will be officially launched on 30th September 2014. I have the Flat Top Foundation Brush to share with you. I have use this brush for 10 days now, which I think it is a sufficient trial period for me to share my experience. 1. The quality of the bristle is really good. In terms of the bristle, I like how it is so soft but still able to pick up the products really well. The density of the bristles is just nice, when you applying the product (especially liquid foundation), the product covers the skin evenly. Use a circular motion to get an even and flawless effect. 2. The presentation of the brush is sleek, which I love the most about this brush. The handle is in black gloss and the ferrule of the brush is in shiny tri-chrome copper. 3. The size is within a palm size. Not only it is convenient for traveling. It is also very easy to grip when you use it for everyday application. 4. The price of the brush is pretty affordable for its quality. The retail price for this brush is only RM55. This brush is so similar with Sigma F80, and the Sigma one probably cost RM100. For half the price, this is a pretty good deal. 1. Overall I love everything about this brush, except one thing... The bristles are so compact that it requires a bit more effort to clean, especially the middle part. There are some remains of the product stuck in the middle of the brush even after I clean it twice. If you're a lazy person like me, you might get a little irritated that you have to put in more effort in cleaning it. Otherwise, I'm sure this might not be a problem to most of you. You probably can see the difference in application on the photo above. I think this is good brush to recommend to you all if you are looking for a quality and affordable foundation brush. You can get this brush at CCM's website. For my readers, I have a 15% off promo code for you to try this brush. Just enter MDBEAUTY15 at the check out and the price of the brush will be reduced to only RM46.75*. I think that is a pretty good deal, so head on to the site to get one and try it out yourself. *Promo code valid until 15 June 2015.